I’ve been running an information marketing company for the last four and a half years, but it wasn’t until three months ago that I started developing an email newsletter for readers of any of my websites. I had always gotten plenty of web traffic from other sources, was doing fine revenue wise and didn’t see the opportunity that existed. Fast forward to January of 2011. My company entered into an agreement with InvestingChannel, easily the most prominent advertising network that sells ads on financial websites. They said that if I had an email newsletter, they could probably sell some display ads on it. I wasn’t terribly excited about the opportunity, but I thought I’d throw something at the wall to see if it stuck. In order to have something to offer via email on a regular basis, I took some of the information that my company gets from various data providers and repackaged it in a daily email newsletter. One of my company’s websites, American Banking & Market News, reports on what equities research firms are saying about stocks of interest. Specifically, the newsletter is a compilation of daily stock ratings changes from various equities research firms. Initially, I looked at using Aweber or Mail Chimp to handle the email distribution list management, but neither of those offered the flexibility I needed to automatically generate the content of the newsletter and send it out to my subscribers. In the end, I ended up using a MS-SQL database and some ASP.NET code to manage the distribution list and generate the newsletter. I’m using SendGrid for the SMTP service and have avoided any blacklists of note so far. Since American Banking & Market News averages more than 1 million page views per month, it wasn’t terribly hard to get some subscribers. By the end of January, I had more than 1,500 subscribers. By the end of April, that number rose to 5,500. Unfortunately, sending an email to 5,500 people on a daily basis isn’t free. We’re paying ~$125.00 each month to SendGrid for the privilege, which isn’t terrible, but the newsletter should at least pay for itself. Unfortunately the ads from Investing Channel haven’t really generated a ton of revenue to make up for that cost. During the month of April, I pondered what other ways my daily email newsletter could pay for itself and generate some additional revenue for my company. Eventually, I decided that a freemium model was the way to go. I would continue to offer a free, ad-supported version of the newsletter, but also offer a premium version for a nominal monthly fee. I wasn’t sure what features I could include in the premium version of the newsletter, so I sent an email to my distribution list and asked them what they. It turns out that my subscribers had some great ideas that I hadn’t thought of. I received 80 responses within 48 hours and kept track of each response’s sentiment, whether or not they were interested in a premium version and what features they wanted. Overwhelmingly, respondents said they wanted to get the newsletter earlier in the day so that they could make trades based on the stock ratings provided in the email. I also added a few other features to the premium version of the newsletter, such as removing the ads, including ratings that aren’t available in the free version, and allowing users to follow certain stocks and get headlines and ratings about them at the top of each message. Friday, I launched the premium version of the product. I’m offering a special to my existing subscribers ($9.97 per month or $100 per year through the end of the month) and had 12 people sign up the first two days. Ten of them prepaid for the year and two opted to pay monthly. 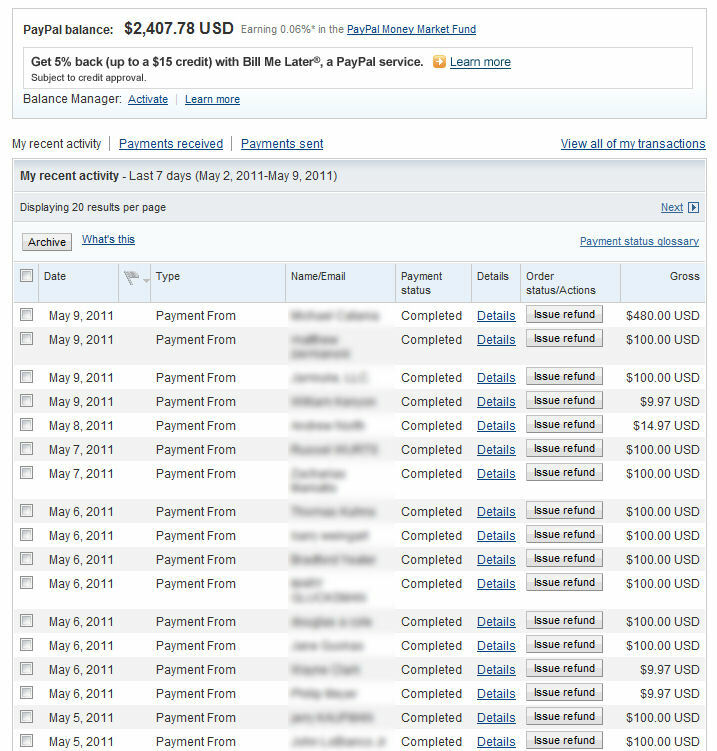 Over the weekend, $1020 was deposited into my company’s PayPal account from new newsletter subscribers. I learned in a matter of 24 hours that email newsletters can be profitable and that people will pay for information that’s well packaged, even if it’s available elsewhere for free. My guess is that the initial wave of registrations will continue through the first few days of this week and will taper off after that. I will also likely promote the discounted pricing a couple of times to my distribution list before the offer expires. I also have all sorts of optimizations that I’d like to try to increase the newsletter registration rate. The initial amount of money that the newsletter has made is nice, but it’s not terribly impressive in the grand scheme of things. What is impressive is that the money that the newsletter makes is truly passive income. As long as my company keeps delivering a quality product, customers will keep paying their monthly or annual subscription fee and my company will keep making money. The other major benefit of having a paid email newsletter is income diversification. Like most companies that run large websites, we are dependent upon traffic from search engines and social media. As we’ve learned from the Google Panda update that hit a couple of months ago, those traffic sources could drop off for an unknown period of time at any given point. The ongoing revenue from the email newsletter is completely independent of the traffic sent by Google, the Yahoo Finance message boards or Twitter. The moral of the story is that email lists do matter in business, especially when you have something to sell to your list. Including display ads in a free newsletter likely won’t generate much revenue. Some people have had success promoting other people’s products via affiliate programs, but it’s much better if you can keep 100% of the sale, verses earning a 5-20% commission. Excellent article. Love the stats. Thanks for sharing. Good stuff, Matt–thanks for sharing. How did you set up the recurring subscriptions on PayPal for the newsletters & sync up the list recipients w/ their subscription? Also, any idea on if going with a purely premium product from the get-go would be worthwhile? Or do you find that the value of the list as far as selling premium products, getting a "foot in the door" with potential premium subscribers is worth it? Hi DJ – I used PayPal's IPN API to track subscription setups and cancellations. Certainly there are people that do okay with only premium products, but I think the value is in having a big email list to send to.